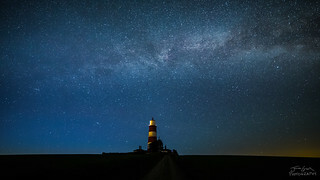 The recent good weather was an excuse to head to Happisburgh, Norfolk to test my new Samyang 14mm f/2.8 lens. The Milky Way is visible over the lighthouse, with the Altair and Deneb stars visible amongst the others. This is a stack of 5 images all at 20 seconds, ISO 3200.